Covered Pergola - Who Has The Best Covered Pergola? 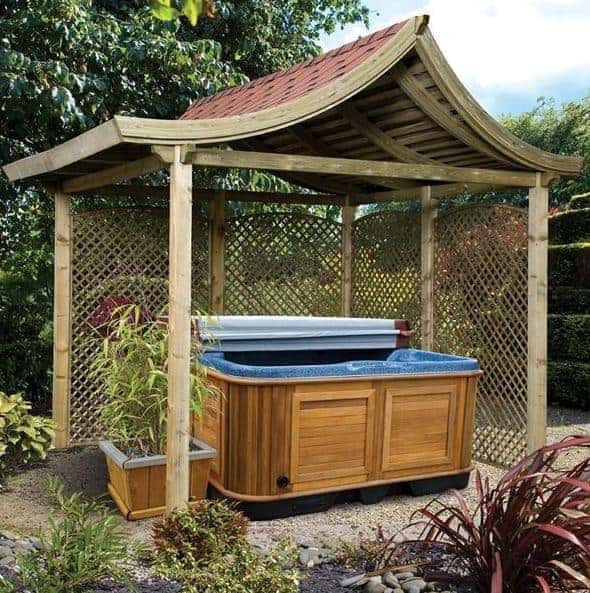 It’s easy to see why pergolas are such popular garden buildings, as they’re not only a great place to grow plants they also make a beautiful feature. 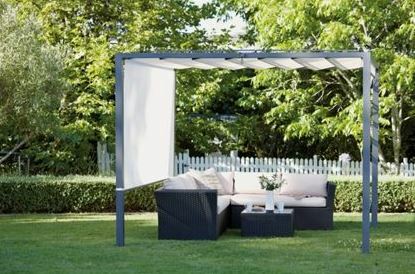 A covered pergola, however, is a much more flexible and functional structure, as they can be used to provide shade to people or plants, and can also be used as a sheltered location for a barbecue or al fresco meal. With an increasingly large choice available, from free standing models to those designed to be attached to a house, WhatShed have created this handy guide to help you find your ideal covered pergola. Covered pergolas can take many forms, from simple and effective canopy clad structures to more intricate gazebo-like buildings, so selecting the five best for our league table was a difficult task. In doing so, we looked at the cost and value for money of each building, as well as their design and looks, and any useful and value adding features they may have such as an extended warranty. We’ve chosen the number one covered pergola available to buy online in the UK today, and four diverse but high quality runners up. 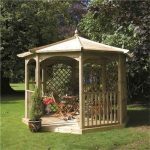 It’s well done then to the tea house pergola which we feel is the number one covered pergola that can be bought online in the UK today. It gains this position in a very diverse and high quality league table by offering good value for money, a long warranty period, and above all a very attractive design. 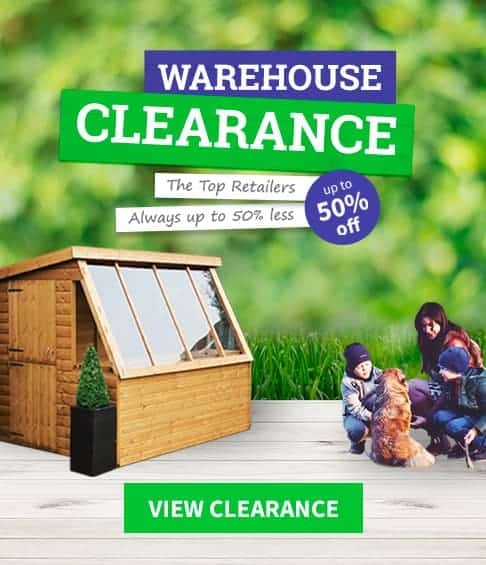 From outdoor pergolas, to plastic greenhouses, and all kinds of garden building in between, WhatShed will bring you the in depth reviews that can save you money and help you make a great purchasing decision. A covered pergola can come in many different styles, ranging from the simple to the ornate, and this tea house style building is the most attractive pergola of any kind that we’ve seen. That means that not only is this an ideal place to grow and display climbing plants, it can also become a focal point for your garden as a whole. 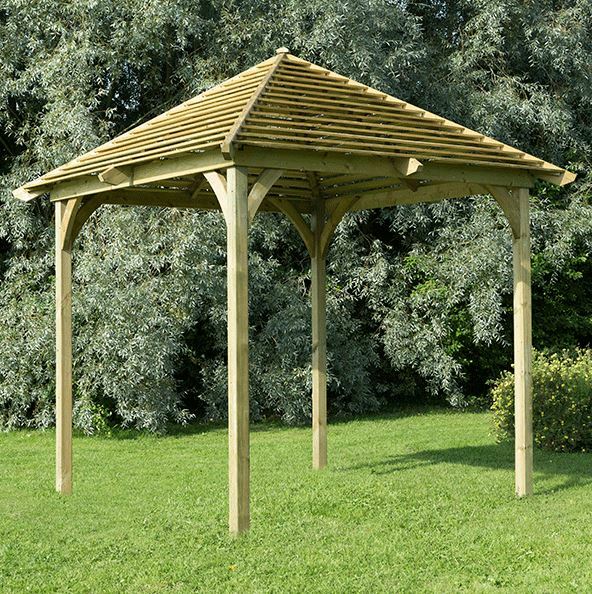 With a base width of 3.40m and a base depth of 3.60m this is also the largest covered pergola to feature in this WhatShed league table, and this combination of good looks and generous dimensions is enough to carry it to the number one position. Style wise it takes its inspiration from elegant Japanese tea houses, and yet it’s so well constructed that it won’t look out of place in any garden. The first thing that caught our eye was the ornate roof which is constructed from curved timber covered in shingle tiles which has then been placed over a traditional open pergola top. It not only takes the aesthetic appeal to another level, it also adds more shade and protection from rain. We were also pleased to see that extra weather protection is given to the wood, thanks to an initial pressure treatment that also brings with it a 15 year warranty. 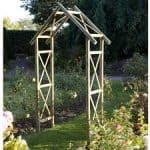 As this also applies to the two trellised sides, this is a durable, attractive and versatile covered pergola. From the highly ornate covered pergola that takes the top spot in our top five league table, we come to a much simpler example, and yet it’s still one that can be very practical and one that should to be prove very long lasting as well. These qualities earn it second place in our list, and the feature that really stood out for us was the pyramidical roof that covers the pergola itself. The slatted effect lets light shine through on a sunny day and yet it’s still effective at carrying rainwater away. What was also instantly noticeable about the roof is just how tall it is, with a ridge height of 3.31m and an eaves height of 2.24m. 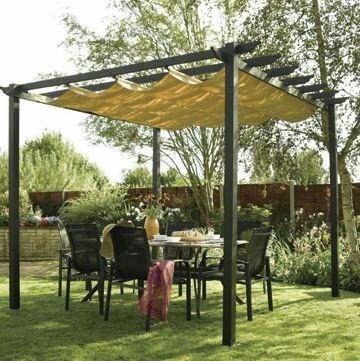 We feel that this covered pergola would be an ideal to entertain guests on a summer evening, and of course it can have a barbecue or a dining table and chairs positioned underneath it. It was pleasing to see that sustainably sourced and smooth planed timber had been used throughout, and this gives the structure a reassuring feel of strength and stability. 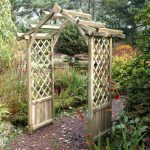 With the timber having been pressure treated by the manufacturer as well, it’s guaranteed against rot for 15 years, a value adding feature which we don’t always find on the pergolas we review. This covered pergola has a design all of its very own, and we found it simple yet effective, and visually striking at the same time. 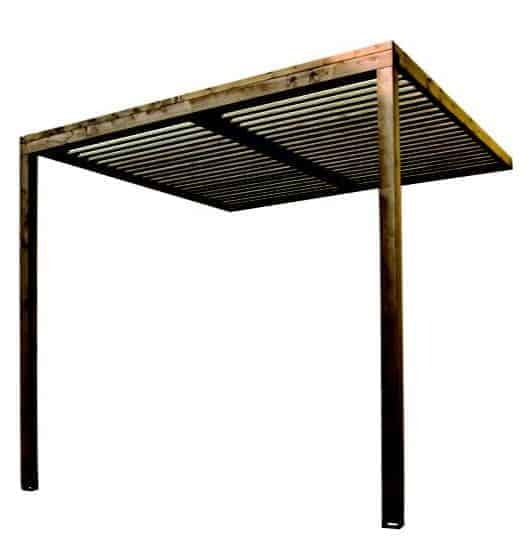 It also represents exceptional value for money for a garden structure with a width and depth of 2.95m, which is why it earns a place inside our list of the top three closed pergolas that can be bought online in the UK right now. 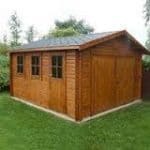 Whilst it doesn’t come with an extended warranty, which is something we usually like to see, the steel and aluminium frame should be very durable and weather resistant, so that in itself doesn’t put us off recommending it. What makes this different to any other covered pergola that we’ve reviewed is that the tough polyester cover on top of the four sided pergola is easily adjustable. That’s because the cover is arranged into panels which can then be opened or shut in much the same way as a window blind. In this way the owner can decide whether they want to allow the sun to shine down or to increase the amount of shade, and so we think this would make an ideal pergola for dining or entertaining underneath, and at a price that makes it attractive even to those with a small budget. If you like to hold dinner parties, then starting or finishing the party outside can add an extra touch of class to the evening, and this covered pergola makes an ideal location for such an event. By the addition of a strong and weather resistant canvas over a tall and simple canvas, a large rectangular area is created that’s protected from the glare of the sun on a summer day or even a passing shower or two, and as there are no sides it allows an unimpeded view of the garden. 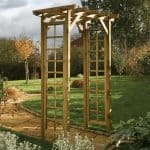 If you want a cost effective and low maintenance pergola, this is certainly worthy of consideration. What makes this great value covered pergola different from many others that we’ve seen is that the canvas cover is easily removable, so that it can be stored safely away during the winter months when it won’t be needed, or taken off for cleaning. It’s also retractable meaning that it can be quickly adjusted to allow extra sunlight in during the day. The pergola frame below it measures three metres squared, so there’s enough room for a small group of people to shelter underneath it. Even though it’s a simple construction we still found it an attractive one, thanks to the taupe colour of the canvas that complements the gun metal grey powder coated aluminium frame. Pergolas come in two main styles, even though there’s a lot of variation within these main divisions. 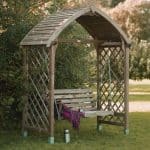 Firstly there’s the stand alone pergola, which when covered sometimes bears similarity to a gazebo, and then there’s the lean to style pergola that needs attaching to a house or supporting wall. This is the only lean-to pergola to make our covered pergola league table, and it brings with it several advantages over a traditional pergola. Firstly, it’s much more stable, and this is especially noticeable in windy conditions. Secondly the supporting wall also offers extra protection against the elements, although we were pleased to see that this Rothley pergola was already very well protected. The European spruce used for the timber section of this covered pergola has been given a dark brown treatment, protecting it against both rot and UV from the sun. That’s why it comes with a 10 year warranty, which brings added peace of mind as well as added value. We also liked the use of polycarbonate for the covering, as of course this is not liable to rot or rust as other substrates can be. The only thing preventing this from being placed higher up our league table is its price, which is greater than we see on most of the other eight foot by eight foot covered pergolas we review.